2012 was the best year in the firm's history. Strategic Discipline's focus on priorities, meetings and metrics made a significant the difference in our ability to achieve our targets. The difference we've seen compared to other business development processes within a very short period of time, in some cases within days or even hours is you end up with actual work product, deliverable plans and agendas that help. Doug's Four Decisions Workshop has allowed our company to focus on our top priorities for the year. With the use of the 1 page strategic plan, company and individual dashboards we are better able to track performance and measure results. For the first time we have a clear company goal with everyone working towards that common goal. We are extremely excited to continue working with Doug in the future. Daily Huddles are by far the best thing we've learned. Lots of our operations decisions have been made through the use of the daily huddle process. Having four daily huddles each day is a pain, yet it's the most productive and best thing that's happened to me as a manager. Just wanted to let you know our first Supper Huddle was a huge success!! Your help certainly was beneficial in its success!! Thanks again for all of your help!!!. In 2013, in addition to growing sales dollars and market share, we cut our return beer rate (ROR) by over 35%. Nearly $600,000 less beer was double handled and brought back to the warehouse by your efforts. This improvement drove the revenue and gross margin numbers up, as well as helped considerably in reducing warehouse, merchandising, and delivery costs. Five years into my career as a radio salesperson I was interviewed for a sales position with HILTI. I was frustrated at the time with my career and income, and HILTI seemed like a good opportunity. 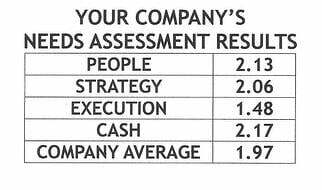 HOW DOES YOUR BUSINESS RANK ON THE FOUR DECISIONS? 1. Priorities: Determine your #1 Priority. Achieve measurable progress in 90 days. 2. Metrics: Develop measurable Key Performance Indicators. 3. Meetings: Establish effective meeting rhythms. (Cadence of Accountability) Compounding the value of your priority and metrics. (BRAND PROMISE GUARANTEE): We will refund all compensation if our disciplined coaching and proprietary tools fail to meet your expectations. The Strategic Discipline Blog focuses on midsize business owners with a ravenous appetite to improve his or her leadership skills and business results.